Inner Farne and its lighthouse. There are white bird droppings on the cliff. 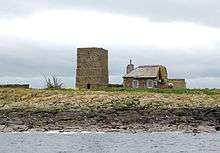 The earliest recorded inhabitants of the Farne Islands were various Culdees, some connected with Lindisfarne. This followed the old Celtic Christian tradition of island hermitages, found in England, Ireland and Scotland. The islands are first recorded in 651, when they became home to Saint Aidan, followed by Saint Cuthbert. Cuthbert isolated himself on the islands until he was called to the bishopric of Lindisfarne, but after two years he returned to the solitude of the Inner Farne and died there in 687, when Saint Aethelwold took up residence instead. Among other acts, Saint Cuthbert introduced special laws in 676 protecting the eider ducks, and other seabirds nesting on the islands; these are thought to be the earliest bird protection laws anywhere in the world. The islands were used by hermits intermittently from the 7th century. These included Saint Bartholomew of Farne. The last hermit was Thomas De Melsonby, who died on the islands in 1246. A formal monastic cell of Benedictine monks was established on the islands circa 1255. The cell was dependent on Durham Abbey, now Durham Cathedral. A very small cell, it was usually home to only two monks, although on occasion this rose to as high as six. The cell was dissolved in 1536 as part of King Henry VIII's Dissolution of the Monasteries. Following the dissolution of the monastic cell on the islands, the islands became the property of the Dean and Chapter of Durham Cathedral, who leased them to various tenants. The islands remained a detached part of County Durham until 1844, when the Counties (Detached Parts) Act transferred them to Northumberland. In 1861 the islands wereched sold to Charles Thorp, who was at the time Archdeacon of Durham. In 1894 the islands were bought by the industrialist William Armstrong, 1st Baron Armstrong. The islands are currently owned by the National Trust. Remains still exist of the 7th century anchorite cell used by Saint Aiden and Saint Cuthbert, as do the remains of a 14th-century chapel associated with the cell. Known as St Cuthbert's Chapel, the chapel is described as a "single-cell building of 4 bays". The remains of a second chapel have been incorporated into a later building. The Farne Islands are associated with the story of Grace Darling and the wreck of the Forfarshire. Grace Darling was the daughter of Longstone lighthouse-keeper (one of the islands' lighthouses), William Darling, and on 7 September 1838, at the age of 22 years, she and her father rescued nine people from the wreck of the 'Forfarshire' in a strong gale and thick fog, the vessel having run aground on Harcar Rock. The story of the rescue attracted extraordinary attention throughout Britain and made Grace Darling a heroine who has gone down in British folklore. 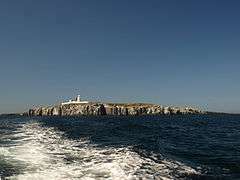 The islands have no permanent population, the only residents being National Trust Assistant Rangers during part of the year: they live in the old pele tower on the Inner Farne (the largest and closest inshore of the islands), and the lighthouse cottage on the Brownsman in the outer group. The pele tower was built c.1500, by or for Thomas Castell, Prior of Durham. Longstone lighthouse in the Farnes from where Grace Darling and her father launched their rescue. Built in 1826 and originally named Outer Farne Lighthouse. A minor light was also established on the north west of Farne between 1811 and 1910. Site of the former lighthouse on Brownsman Island (1811–26): its base remains attached to the right of the keeper's cottage. Earlier, a light used to be shown from the tower on the left. All the operational lighthouses on the Farnes are now automatic and have no resident keepers, although in former years they did. The lighthouse is now maintained by Trinity House via its local lighthouse attendant, George Shiel, who provides guided tours inside the lighthouse. Ruins of some of the older lighthouses may be seen: for example on the Brownsman, where there are two. Before the lighthouses there were beacons on several of the islands. The prominent white streak on the cliff facing the mainland (see photo) is often thought by visitors to be bird droppings: although many parts of the islands do exhibit this colouring, in this case it is the result of chalk deposits from the many years of spent calcium carbide from the lighthouse being thrown down the cliff; this calcium carbide was used to generate acetylene which was used as fuel for the light before electricity came. In the warmer months the Farnes, an important wildlife habitat, are much-visited by boat trips from Seahouses. Local boats are licensed to land passengers on Inner Farne, Staple Island and the Longstone; landing on other islands is prohibited to protect the wildlife. At the right time of year, many puffins can be seen and these are very popular with visitors; on the Inner Farne, the Arctic terns nest close to the path and will attack visitors who come too close (visitors are strongly advised to wear hats). Some of the islands also support a population of rabbits, which were introduced as a source of meat and have since gone wild. 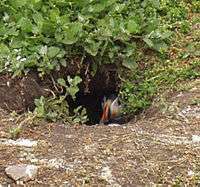 The rabbit and puffin populations use the same burrows at different times, the puffins being strong enough (with a vicious bite) to evict the rabbits from the burrows during the nesting season. The islands also hold a notable colony of about 6,000 grey seals, with several hundred pups born every year in September–November. Roseate tern – 0 pairs (endangered species) - Several individuals spotted. A total of 290 bird species have been recorded on the Farnes, including in the 1760s, an example of the now extinct great auk. On 28–29 May 1979, an Aleutian tern, a rare tern from the Aleutian Islands in the North Pacific Ocean, visited the Farnes. It was the first, and still the only, member of its species ever seen anywhere in Europe. It remains a complete mystery how it arrived here. A longer-staying unusual visitor was "Elsie" the lesser crested tern, who visited the Farnes every summer from 1984 to 1997; during that period she (paired with a male Sandwich tern), raised several hybrid chicks and attracted several thousand birders keen to see this species in Britain. Lesser crested terns normally nest on islands off the coast of Libya and migrate to West Africa for the winter; it is thought that "Elsie" took a wrong "tern" at the Straits of Gibraltar on spring migration. An Arctic tern from the Farnes, ringed as a chick not yet old enough to fly in summer 1982, reached Melbourne, Australia in October 1982, a sea journey of over 22,000 km (14,000 mi) in just three months from fledging. This remains one of the longest distances travelled by any bird. One classic view of the Farnes, very popular with photographers, is that from the harbour at Seahouses. However, they are closer to the mainland further up the road northwards towards Bamburgh and excellent views may be seen from here, in the vicinity of the Monks House Rocks, as well as from Bamburgh Castle and beach. The Farnes are resistant igneous Dolerite outcrops. These would originally have been connected to the mainland and surrounded by areas of less resistant limestone. Through a combination of erosion of the weaker surrounding rock, and sea level rise following the last ice age, the Farnes were left as islands. Because of the way the rock is fissured, Dolerite forms strong columns. This gives the islands their steep, in places vertical cliffs, and the sea around the islands is scattered with stacks up to 66 feet (20 metres) high. Many of the small islands are bare rock, but the larger islands have a layer of clay subsoil and peat soil supporting vegetation. The rock strata slopes slightly upwards to the south, giving the highest cliffs on the south and some beaches to the north. As well as being popular with bird watchers, the Farne Islands are a popular scuba diving location, with a variety of sites suitable for all levels of diver. The islands appeal to divers for the seals and wrecks. The grey seal colony at the Farnes numbers about 5,000. They are curious and will often look in on divers in the water and are impressive to watch underwater. Chris Christenson, a Danish steamer that sank on 16 February 1915. She lies close into the reef off the south tip of Longstone, Outer Farnes in about 98–115 feet (30–35 m) at (55°38.397′N 1°36.182′W﻿ / ﻿55.639950°N 1.603033°W﻿ / 55.639950; -1.603033). Abessinia, a 453-foot (138 m) German steamship that drove onto Knifestone, Outer Farnes, on 3 September 1921. She lies in about 30–66 feet (9.1–20.1 m) at (55°38.9′N 1°36.12′W﻿ / ﻿55.6483°N 1.60200°W﻿ / 55.6483; -1.60200). Brittania, a 740t, 210-foot (64 m) British cargo/passenger steamship that struck the Callers, Outer Farnes, in thick fog on 25 September 1915. The wreckage lies between about 26–98 feet (7.9–29.9 m) at (55°37.688′N 1°35.991′W﻿ / ﻿55.628133°N 1.599850°W﻿ / 55.628133; -1.599850). St Andre was a 1120t French steamship carrying pig iron. On 28 October 1908 she hit the Crumstone and floated off to sink finally at Staple island. She lies in about 56–82 feet (17–25 m) at (55°37.84′N 1°37.18′W﻿ / ﻿55.63067°N 1.61967°W﻿ / 55.63067; -1.61967). It is generally possible to dive at the Farnes regardless of wind direction. There is always shelter somewhere. Some dive locations even provide the opportunity to combine diving and bird watching, in particular the Pinnacles, where guillemots can be found fishing at safety stop depth. ↑ e travel guide to Northumbria. "There are between 15 and 20 islands in number, depending upon the tide". ↑ www.bamburgh.org.uk. Gives details of Grace Darling. ↑ "Farne Lighthouse". Trinity House. ↑ Wallis, John (1769). The Natural History and Antiquities of Northumberland, London: Printed for the author, by W. and W. Strahan. pp. 340–1. ↑ Incredible Birds. Documents Aleutian Tern on Inner Farne in May 1979. ↑ www.towhee.net. Confirms "Elsie" the lesser crested tern visited Farnes. ↑ www.seahouses.org. Gives geology details. ↑ "Farnes area Dive Site Info and Dive conditions". Divesiteinfo.co.uk. Retrieved 2012-07-07. ↑ Archived July 5, 2009, at the Wayback Machine. ↑ The Guardian Travel. Gives some details of scuba diving in Farnes. Wikimedia Commons has media related to Farne Islands. Wikisource has the text of the 1911 Encyclopædia Britannica article Farne Islands.